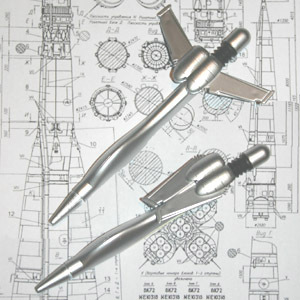 Jet plane ballpen - spacekids - space toys, dressing up costumes, kids spacesuits, astronaut food, cool space stuff! A fun ballpen, in the shape of a fast jet aeroplane. The pen is approximately 6 inches long, and features folding wings complete with undercarriage wheels. Picture shows the pen with wings folded and fully extended.